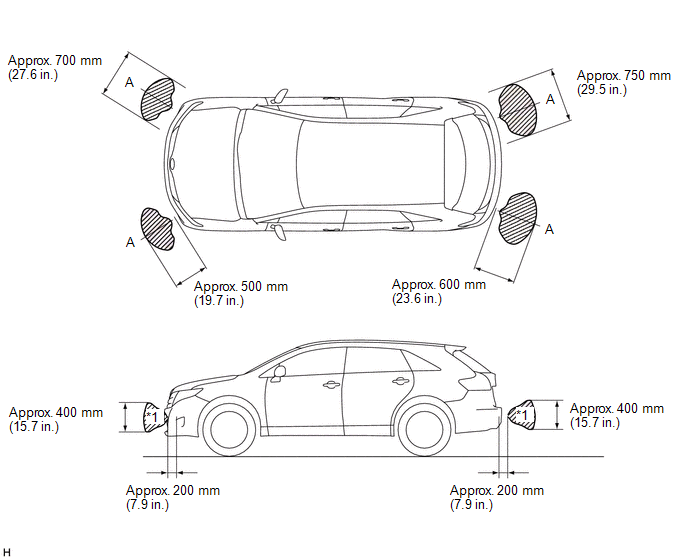 (1) If an open circuit is detected between the ultrasonic sensors and the clearance warning ECU assembly, if a sensor malfunction is detected or if a sensor is covered with foreign matter, such as mud or snow, the clearance warning buzzer sounds to indicate a malfunction as shown in the illustration. 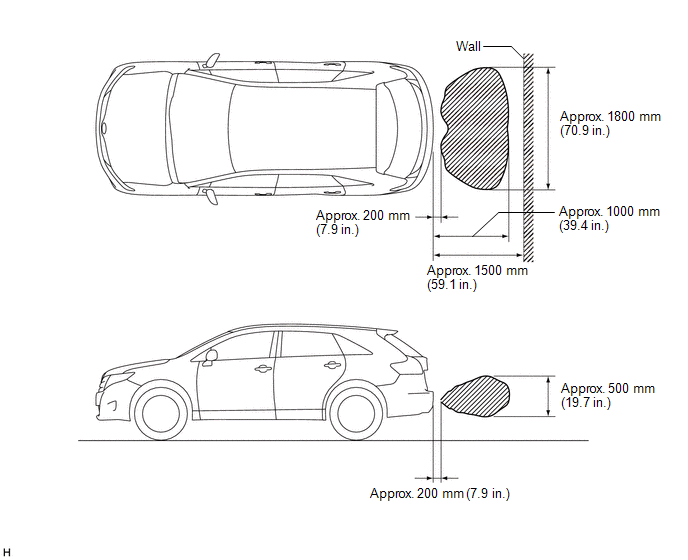 Make sure that the vehicle does not move by applying the parking brake firmly. (1) Turn the engine switch on (IG). (2) Move the shift lever to R to check the ultrasonic sensors. (b) Turn the clearance sonar main switch on. (c) Move a 60 mm (2.36 in.) diameter pole near each sensor to measure its detection range. 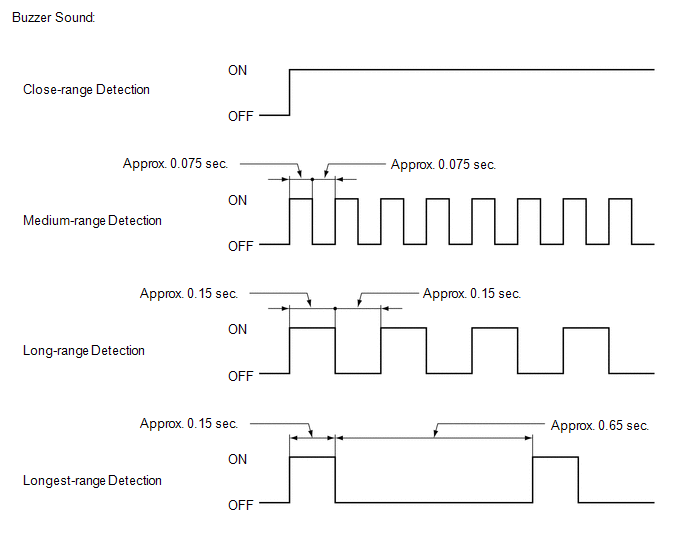 These detection ranges are applicable when positioning the 60 mm (2.36 in.) diameter pole parallel or perpendicular to the ground. The detection range varies depending on the measuring method and type of obstacle (such as walls). Have an assistant move the pole. The No. 1 ultrasonic sensor side view detection range hatched area (labeled *1) represents the cross section of the top view of the lines of detection range A. The hatched area *1 does not represent the entire side view detection range. 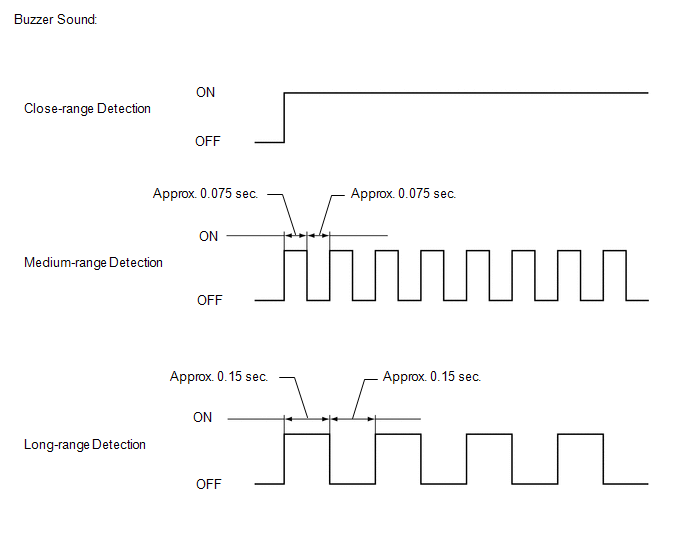 (d) When the ultrasonic sensors (front corner sonar) have detected an obstacle, check that the buzzer sounds. Ultrasonic waves are used to measure the detection range; however, the detection range may vary depending on the ambient temperature. (e) When the ultrasonic sensors (rear corner sonar) have detected an obstacle, check that the buzzer sounds. (f) When the ultrasonic sensors (back sonar) have detected an obstacle, check that the buzzer sounds.